Contracts for difference (CFD) are leveraged trading instruments written over existing underlying securities. 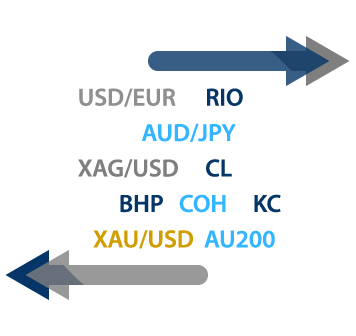 The CFD allows you to control a position in a given security and gain exposure to price movements without having to fund the full value of the position. CFDs differ from HIN shares in that they can be long or short and the owner of the contract does not own the underlying security. Trading CFDs with Gleneagle Securities is built upon a foundation of Direct Market Access (DMA) execution. We provide clients with a pure agency brokerage service and link you directly to the relevant exchange with no requotes or spreads. Our live data feed lets you see level 2 market depth on most exchanges and our range of order types ensures that you trade with confidence. Trading CFDs gives you exposure to price movements of underlying securities without having to own them. You may profit from underlying security price rises by taking a long position in a CFD. Alternatively, you may also profit from a price fall by taking a short position in a CFD. Make a small cash deposit, called an Initial Margin, that serves as collateral. Buy a CFD to open a long position or sell a CFD to open a short position. Profit and losses accrue in real time as market prices fluctuate. Sell the CFD to close a long position or buy the CFD to close a short position. Trader A purchases 100 BHP @ 34.00 at a cost of $3,400. Trader A sells the 100 BHP @ 36.00 and receives $3,600. The $200 profit represents a 5.9% return on the initial $3,400. Trader B purchases 100 BHP @ 34.00 using a CFD. Trader B’s cost of this purchase is 10% of the value of the position or $340. Trader B sells the 100 BHP @ 36.00 and receives the initial margin plus realised profit or $540. The $200 profit represents a 59% return on the initial $340. Automatic short selling is available on over 1300 CFDs worldwide. Should you wish to go short a security not on this list, simply contact our dedicated dealing desk to request a stock-borrow. In most cases we will advise you of the outcome of your request within 20 minutes. Gleneagle Securities gives clients access to 21 exchanges worldwide. Gain access to US, Asian, European and Australian equities markets, futures markets and commodity markets around the world. Gleneagle Securities offers a range of conditional order types, including stop losses, guaranteed stops and trailing stops, that can help you manage the risks of leveraged trading. The ability to take long or short positions in CFDs offers potential profit opportunities in both rising and falling markets. In addition, most CFDs do not have an expiry date, so you can trade them according to your time frames. With CFDs you can potentially make a higher return on investment than if you invested in the underlying security directly. CFDs require only an Initial Margin, representing a fraction of the total underlying value, to open a position. Utilise CFDs to hedge your portfolio no matter its size or composition. For example, if you hold a long position in a single stock, you can open a short position in a CFD for that stock to provide protection against negative movements. Gleneagle guarantees our clients no requotes and no spreads on CFD trades, allowing them to trade efficiently according to the strategies they employ. Open CFD positions can be affected by gapping if the market opens at a significantly different price from the previous day’s closing price. This may have particularly adverse effects on leveraged positions. As a leveraged financial product, CFDs carry significantly more risk than their underlying securities. While leverage allows traders to benefit from higher returns, it can also lead to losses greater than the initial investment. If you are already one of Gleneagle Securities valued clients, click the login button below, follow the prompts to add CFDs to your list of accounts and start trading! Eager to start trading CFDs? Click the button below to open an account. It’s quick, easy to set up and you’ll be trading in a matter of minutes. How do I place CFD trades with Gleneagle? CFD trades can be placed by either calling up Gleneagle brokers directly or through our online webiRESS platform. What is the minimum amount I need to place a CFD trade? There is no minimum amount required to place a CFD order. There is no minimum account balance required. However, you do need to deposit funds into your margin account in order to trade CFDs. What do you accept as collateral? Cash or stocks are consider acceptable collateral when trading CFDs.